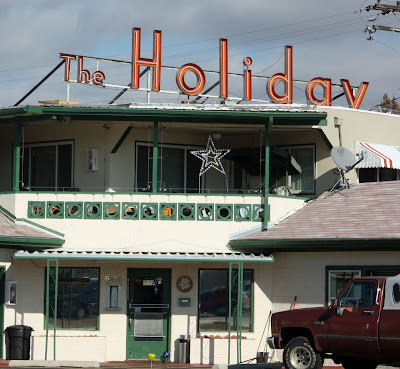 When I was a kid living in a small town north of Boise, this hotel looked so fancy. It had a swimming pool and the sign looked really good at night. I never got to stay there, and funny, later when I moved to Boise, this hotel didn't look so fancy to me anymore. Plus, they filled in the pool to make room for more parking lot. I remember once seeing a spectacular painting of this hotel in its glory days at the Boise Art Museum. Any Boiseans familiar with that painting or artist? I love that sign. I bet that was a neat place back in the day. Isn't it amazing how our perspective changes as we age? I can see where this might have dazzled you when you were a child. Great photo. I don't know about the sign, but I know what you mean about looking at things so much differently when you're a kid - it's the innocence of being a kid - that WoW factor that I still have today! hehehe - I'm such a kid! This reminds me a bit of a small place I stayed at once in Daytona Beach when I was about 21. The place had these little cottages or cabins on the beach. I thought I had died and gone to heaven! No hotel room but a little house on the beach!! I returned years later and, well, the same place looked prett seedy! Heh! I remember we stayed there one night and even though it was a nice location the bugs were bad and, well, it just was not a great place. But everything is relative and for a group of college kids, well, we thought it was the best thing ever!